For the past 50 years, many of South Florida’s rich and famous have counted on the E.J. Schrader Mattress Co. for a good night’s sleep. From megayachts to mansions, the family-owned mattress maker builds custom bedding to suit most any space, size or taste. That made-to-order approach has landed Schrader mattresses in beds around the world, cushioning sleep for actors, athletes and the affluent. “We go the extra mile here because our customers want the best,” said Blair Schrader, 58, who runs the company with his wife, Diane, 56. That extra-mile effort was never more tested than last month. A four-door Bentley pulled up to the mattress warehouse, and the driver came in with the most unusual request yet. The automobile’s 71-year-old owner wanted a mattress to fit in the back seat. He frequently travels from Cape Cod to South Florida (he winters in Lost Tree) and needs to be able to lie down occasionally. No problem, the Schraders said. They measured the Bentley and made a five-piece removable mattress set: two pieces to fill the floorboards, two to level the curved seats and a 3-by-5 foot mattress to top everything – all in about a week’s time. “No two days are the same in this factory,” Diane Schrader said. With prices ranging from hundreds to thousands of dollars, the niche manufacturer builds mattresses for everything from antique and trundle beds to boats and recreational vehicles. It makes adjustable mattresses and his-and-her mattresses with a different firmness on each side. It makes foam or spring mattresses. It makes chemical-free mattresses and mattresses for baby cribs. It’s even made dog beds. And yes, it makes standard-size mattresses, too. But its queen or king beds are customized for firmness and quality. Crafted in an unassuming warehouse on Norton Avenue just west of U.S. 1 in West Palm Beach, Schrader mattresses are made one at time, mostly by hand and with decades-old machines. Some of those machines are the same ones that were used by Blair’s father, Enoch Schrader, who founded the company in 1956 after 25 years of making mattresses for other manufacturers. The elder Schrader didn’t want to mass-produce mattresses like many of his competitors. Rather, he wanted to tailor his bedding to each customer’s needs. Although the Schraders have followed industry advancements in materials and styles, they still build mattresses the old-fashioned way. Stacks of steel springs, quilted ticking and mattress foam fill the warehouse. A crew of about four people cut, sew, assemble and package the mattresses. “We’ve gone as far as we can on automating and modernizing. If we did any more, we wouldn’t be who we are,” Blair said. That’s why they still have a tufter, a device used to put in traditional button tufts that hold mattresses together tightly. “Our older Palm Beach clientele still want the old-style mattresses,” Diane said. Blair, who has worked at the business since he was 14, has been at its helm for 26 years. His father died two years ago at 90, but even in his final years he came into the mattress warehouse three days a week. “I wish he could have made it to see 50 years,” Blair said of the company’s golden anniversary. They’re planning a celebration for October. Schrader makes 4,000 to 5,000 mattresses a year, Blair said. Its bedding sets sell for anywhere from $800 to $10,000, depending on how specialized it is, Diane said. The mattress market is dominated by large corporations, often called the Big S’s – Sealy, Serta and Simmons. But its roots lie with family-owned manufacturers such as Schrader. “The mattress industry has a long tradition of being family-owned businesses, but that’s continued to change over the years with these big investment firms coming in and buying them every day,” said Nancy Shark, spokeswoman for the International Sleep Products Association in Alexandria, Va. The industry has seen banner sales in recent years, boosted by a strong housing market and a move to higher-quality and specialty products, according to the association, a trade group of more than 600 mattress makers and bedding component suppliers in 50 countries. U.S. mattress makers shipped 42.8 million units last year, worth nearly $6.4 billion, Shark said. In the past decade, Schrader’s sales have grown 2 1/2 times, said Blair, who declined to release exact figures. The privately held company ships mattresses all over the world, but its primary customer base is in South Florida. It doesn’t have retail shops. It sells directly to individuals, but most of its sales are through interior designers. And some pretty lofty names have been snoozing on Schrader mattresses. Their list of legendary clients includes Bing Crosby, Jimmy Buffett, Alan Jackson and Jimmy Dean. Even royalty has slept on a Schrader mattress. They once made a bed for a Palm Beacher who was preparing for a visit from Prince Charles, Diane said. 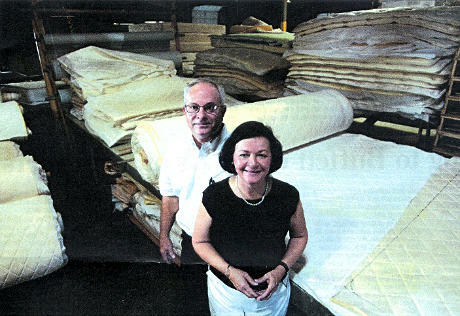 Many of Palm Beach County’s tony interior designers rave about the Schraders and their mattresses. Foster has been selling Schrader mattresses to her clients for about 30 years. Several designers praised the Schraders for their customer service, workmanship and fair prices. Fhillips, who also sleeps on a Schrader mattress, sells a lot of antique furniture and needs custom mattresses for the odd-sized beds. He said he uses Schrader products across the country. When you’re in the custom mattress business, you get a lot of unusual requests. And Blair and Diane Schrader have learned to try just about anything to build the mattresses of their customers’ dreams. —The largest mattress they ever made was 10-by-12 feet. (That’s as big as the average bedroom.) They built it last year for a former Florida Marlins pitcher. —Schrader occasionally builds round and pear-shaped mattresses. “We still send a lot of these out to Vegas,” Diane said. Once, by request, they built a round bed with a motor underneath that would spin the mattress. They didn’t ask why. —Mattresses for yachts are a big chunk of E.J. Schrader Mattress Co.’s business. But for the wily sailor, they’ll make mattresses with secret compartments for hiding treasures. And they once built a boat mattress that was about a foot shorter than the bunk. It was for a woman who wanted a space to keep her purse nearby when she slept. —A man once asked Schrader to make a bed for his pregnant wife. She liked to sleep on her stomach and wanted a mattress with holes cut for her belly and her breasts. This was one of the few times the Schraders said they just couldn’t fill the request. “If I could have figured out a way to measure around her breasts, I would have tried it,” Diane Schrader said.